With the arrival of warmer weather in recent weeks, I have been moving out of my bear-hibernation mode and away from rich, hot foods. Lately I have been craving light and simple foods, such as vegetables and crackers with hummus. 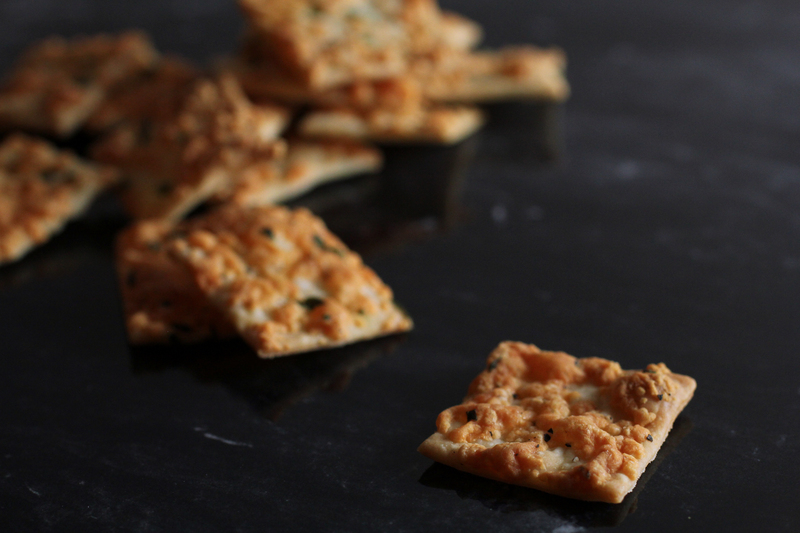 Serious snacking calls for some serious crackers of course, like these cheese and black pepper crackers. Since crackers to me are what cookies are to The Cookie Monster, I usually make a double batch of these. If you’re a serial snacker like me, you might like to try baking these. I made mine with a mexican cheese blend and lots of freshly ground pepper (which made me sneeze a lot, but it was totally worth). Serve with dips, crumble over soups or nibble them on their own. In a medium bowl, combine the flour, salt and sugar, stirring well. To the dry ingredients, add the oil and water and mix until the ingredients come together. If the dough is sticky, add a little more flour. If the dough is too dry, add a little more water. Turn the dough out onto a clean, floured work surface and knead briefly until the dough is smooth and uniform. Cover with a damp towel and let the dough rest for 10 minutes. Sprinkle the dough evenly with freshly ground pepper, grated cheese and parsley. Roll over the cheese with a rolling pin to press it down into the dough. This makes it a little easier to cut and transfer the crackers to the baking tray. Pierce the dough all over with a fork. This will prevent the crackers from puffing too much when baking. Cut the dough into approximately 1″ squares. A pizza cutter works well for this. If you want the crackers to be uniform and have neat edges, you can cut the crooked edges of the dough off (although I find eating the baked crooked crackers a much more enjoyable way to tidy the batch of crackers). Transfer the crackers carefully to two baking trays lined with baking paper. 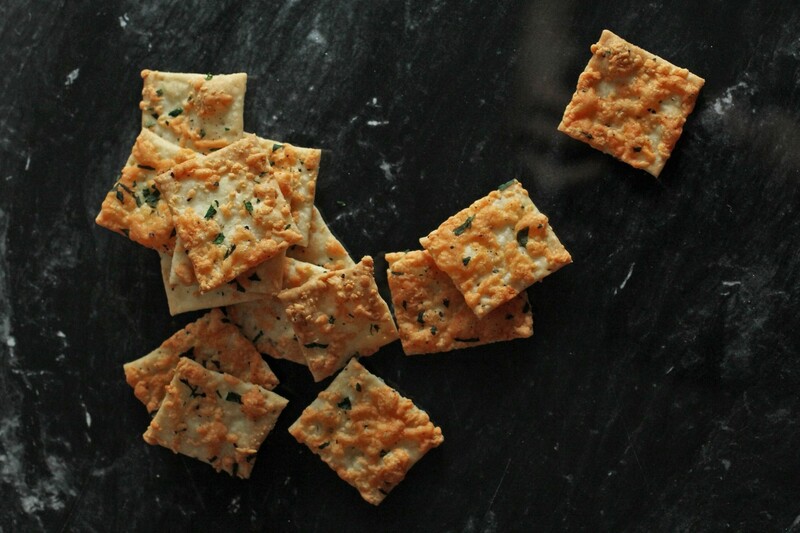 Bake crackers for 12 – 15 minutes, keeping an eye on them at about 12 minutes to ensure they don’t burn! 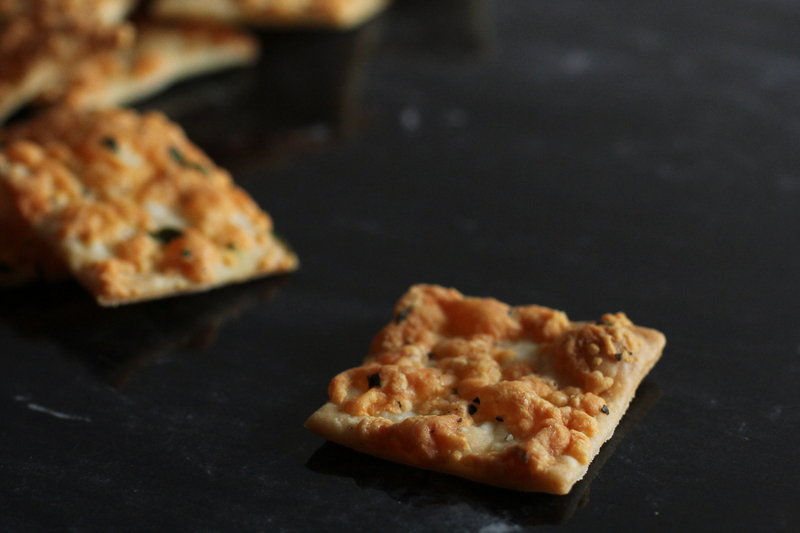 Remove trays from oven and allow crackers to cool on tray. Crackers can be stored in an airtight container for a week. You can season the crackers with other spices if you like – some favourites of mine are garlic powder, cayenne pepper and paprika.